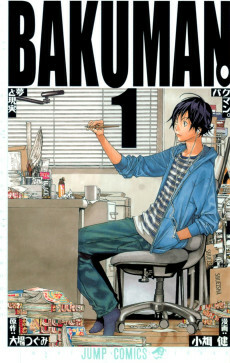 Bakuman follows the story of high school student Moritaka Mashiro, a talented artist who does not know what he wants to do with his future. One day, Mashiro draws a picture of Miho Azuki, a girl he is secretly fond of, during class but forgets the notebook at school. He comes back to find that his classmate Akito Takagi is waiting for him with his notebook. Takagi tries to convince Mashiro to become a manga artist for his stories, leading to Mashiro's disagreement, citing his late manga artist uncle, who died from overworking. Takagi incites Mashiro to meet with Miho Azuki, Mashiro's crush, and tells her the two plan to become manga artists. In response, Azuki reveals her plans to be a voice actress. Mashiro proposes to her that they should both marry when Azuki becomes a voice actress for the anime adaptation of their manga. The two then start creating their manga, under the pen name Muto Ashirogi, in hopes of getting serialized in Weekly Shounen Jump.